The stars of boxing's present and future will be out in full force at the MGM Grand Garden Arena in Las Vegas on Saturday, Dec. 13, when Golden Boy Promotions in association with Khan Promotions and The Great Promotions present a Showtime Championship Boxing tripleheader featuring a pivotal welterweight showdown and two world championship fights, live on Showtime at 9 p.m. ET/6 p.m. PT. In a pair of must-see, high-stakes welterweight matchups, British superstar and former unified super lightweight world champion Amir Khan of Bolton, England will take on former two-division world champion Devon Alexander "The Great" of St. Louis, Mo., while undefeated interim WBA Welterweight Champion Keith "One Time" Thurman of Clearwater, Fla., will defend against Leonard "The Lion" Bundu of Lazio, Italy. Rounding out an action-packed night on the three-fight Showtime Championship Boxing telecast will be WBO Junior Middleweight Champion and 2008 U.S. Olympian Demetrius Andrade of Providence, R.I., who risks his 154-pound belt against tough undefeated young star Jermell Charlo of Houston, Texas. Charlo will make his first attempt at world title glory in a battle of unbeaten junior middleweights. "Getting back in the ring is all I've been looking towards these last few months," said Khan. "I want to show everybody that I'm a major force at 147 pounds and I'm ready to take on the best. This fight with Alexander has been on the table for a while, but it is finally happening and I plan on winning impressively to show that I am truly one of the best welterweights in the world." "I've wanted this fight for a long time and I'm ready to show that I'm worthy of this opportunity and the opportunities ahead after I win on Dec. 13," said Alexander. "I've worked hard my entire life and now the pressure is on to really show what I can do." "I can't wait to get back in the ring and defend my title," said Thurman. "I'm going to give all my fans the performance of a lifetime and prove why my name should be at the top of the welterweight conversation." "December 13 is going to be the biggest night of my professional career thus far," said Bundu. "To be fighting in the United States, in the fight capital of the world, Las Vegas on Showtime against one of the most promising American prospects is a dream come true. But Keith Thurman doesn't scare me. I know that I have what it takes to win and truly make a name for myself throughout the boxing world." "There is no way I'm letting go of my belt," said Andrade. "Jermell Charlo is a good fighter, but nothing is going to stop me from defending my belt and raising my hand in victory on Dec. 13. I am confident that this will be a fight fans won't want to miss." "I am beyond excited to finally get a shot at a world title," said Charlo. "This is what I've been waiting for. I'm ready to be a world champion. Nothing is going to stand in my way. Andrade is the champion and I'm not looking past him at all, but this is my time. I know it. The title will lead to bigger and better things and that is what I'm all about." 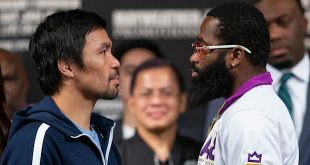 "A huge main event with two former champions looking to take a major step back towards a title shot; undefeated fighters going head-to-head on the undercard; our last big show of the year -Dec. 13 at MGM Grand will have it all," said Oscar De La Hoya, Founder and President of Golden Boy Promotions. "Golden Boy Promotions is finishing 2014 strong and will move into 2015 continuing to make good on our promise to make the most exciting fights for boxing fans." 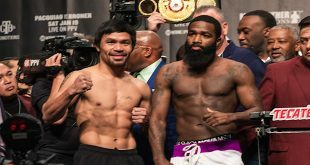 "The Dec. 13 edition of Showtime Championship Boxing delivers on our promise to televise stacked fight cards featuring big name fighters in meaningful fights," said Stephen Espinoza, Executive Vice President and General Manager, Showtime Sports. "The main event, Amir Khan versus Devon Alexander, is a matchup between two renowned former world champions, each at a critical juncture in his career. In the co-feature, Keith Thurman, one of the brightest young stars in boxing, faces perhaps his toughest test to date in the highly regarded and undefeated Leonard Bundu, as each boxer battles for position in the ultra-competitive welterweight division. "The opening bout on the telecast features two very talented undefeated rising stars, champion Demetrius Andrade and No. 2-ranked challenger Jermell Charlo. Each fight on the telecast will have a significant impact on the top-10 divisional rankings." A decorated amateur, Providence, Rhode Island's Andrade (21-0, 14 KOs) turned professional in 2008 after representing the U.S. in the Olympic Games in Beijing. In November of 2013, the talented southpaw won the vacant WBO Junior Middleweight Title with a 12-round decision over Vanes Martirosyan and this past June, the 26-year-old successfully defended his title for the first time with a seventh-round technical knockout over Brian Rose. Charlo (24-0, 11 KOs), 24, is the younger-by-one-minute brother of identical twin, Jermall, who is also a world-ranked undefeated contender at 154 pounds. A tall fighter for his division, Charlo has stepped up in class in some recent fights and is coming off two consecutive terrific points' victories against Charlie Ota in a 12-round fight on May 24 and against Gabriel Rosado in a 10-round battle on Jan. 25. Charlo, also a top-notch amateur, won the bronze medal at the 2005 Junior Olympics. December 13 marks a milestone in Charlo's career as he will do everything he can to capture his first world title. Mares (27-1-1, 14 KOs) of Guadalajara, Jalisco, Mexico, and fighting out of Downey, Calif. is coming off of a unanimous decision victory over Johnathan Oquendo at MGM Grand in July. Prior to his impressive win, Mares suffered the first loss of his professional career to the hands of Johnny Gonzalez, but has since bounced back and is ready to fight. Ortiz (29-5, 22 KOs) is ready to show the boxing world that he still has what it takes to be great. The 27-year-old Ventura, Calif. native has made headlines in and out of the ring, not only as a fighter, but also an entertainer. A former welterweight world champion who has engaged in memorable battles against the best in the boxing business including Floyd Mayweather, Marcos Maidana, Andre Berto and Josesito Lopez. He has also crossed over into the bright lights of Hollywood as a member of the cast of ABC's hit series "Dancing With The Stars" and most recently as part of the film "Expendables 3." Now Ortiz will return to the ring for the first time since his knockout loss against Luis Collazo in January and looks to show the boxing world he's serious about another run at a world title. "Royal Battle: Khan vs. Alexander," a 12-round welterweight bout for the WBC Silver Welterweight Title, is promoted by Golden Boy Promotions in association with Khan Promotions and The Great Promotions and is sponsored by Corona Extra, AT&T and Mexico - Live It To Believe It! The event will take place at the MGM Grand Garden Arena in Las Vegas, Nev. and will air on Showtime at 9 p.m. ET/6 p.m. PT. In the co-main event, Keith Thurman defends his WBA Interim Welterweight Title against Leonard Bundu, and in the televised opener, Demetrius Andrade defends his WBO Junior Middleweight World Title against Jermell Charlo in a bout promoted in association with Joe DeGuardia's Star Boxing and Banner Promotions.